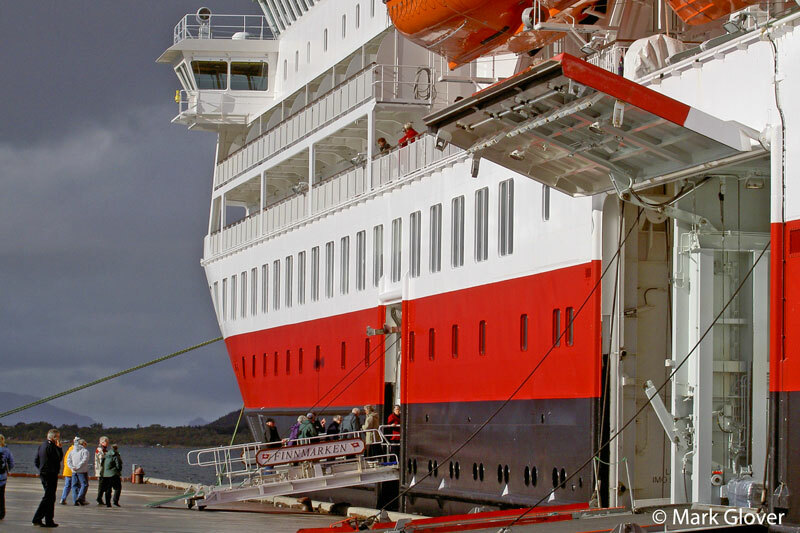 Wouldn't anyone else love to see her sporting white hull back in Hurtigruten again...? Even just for a single season! My ship with the rounded stern is coming back!!!! Hooray!!!!!! No... She has to be painted in Hurtigruten colors. An other thing: why has Midnatsol and Trollfjord a different kind of red stripe on the hull? Is this meant to be a more "modern" look? And how did the color scheme come about anyway? ....And how did the color scheme come about anyway? This is interesting... the first ships to feature colored red/blue stripes on the side were the 82/83 generation ships, but why this came to be, I have no idea. Blue stripes? I know the MS Gann (former MS Narvik) has a blue stripe, but I thought that was painted on after leaving Hurtigruten? Anyway, just read today that Finnmarken will be back on the Norwegian coast from the 16th of February 2012! Vesterålen from 1983 had a blue stripe all the way from delivery till she was rebuilt in the 90's. She was Vesterålens "blue ship". According to this article from NRK ( http://www.nrk.no/nyheter/distrikt/nordland/1.7817351 ), it appears that Finnmarken will undergo conversion back to a Hurtigrute at a shipyard in SINGAPORE. I guess that means our family member there, ombugge, must be the one to keep an eye out for her and provide us with image-materials? That fact has been known for some time now. There are many shipyard here in Singapore with the capability to both drydock and upgrade ships of this type and size. Most likely they will chose Sembawang Shipyard since they have most experience with passenger ship upgrade and conversions. If anybody hear any rumors about which yard, please let me know. Security is quite strict at the yards today, I cannot just walk in without an invitation, or a job to do within the yard. But I will do my level best to get some pics, at least from a distance if I'll in town at the time. Go gentle on me, my first post - but I felt it was a little while since we'd seen a photo of Finnmarken looking like a real Hurtigrute! This one from September 2004 - Stokmarknes I think. Hi and congratulations to your first post. That image has so much Hurtigruten-feeling in it. You're absolutely correct, while beeing a bit exotic looking for the moment, this is how she should look like. Or, hmm, I wonder how she would look like with the red area painted in black and the name of vessel in yellow? Let me take this opportunity to officially wish you a warm welcome on board this friendly forum. I hope and trust your stay with us will be a pleasant and educational one. You have started with a big bang: a great image which shows the ship in an almost sparkling new look. Was it taken during her first days in service? The quality of your image is really great, and I look forward to seeing more from you in the future. Once again, a warm welcome onboard. Finnmarken certainly wasn't very old on that trip - built 2002 I think? - this was September 2004 as we travelled from Honningsvåg to Molde. I particularly remember the stunning views from the large open deck at the bow. Happy memories - really glad that she's coming home. That is as you say, the greatest feature on any of the ships, the bow! I love that you can stand on her bow and see the best views! I have put in an Alert request so should be able to track her to Singapore and to whichever yard here.